When you sign up to live a life of greatness, it important that you understand the less glamorous aspects of maximising your potential. I know that there are people who make it look easy, and becoming one of the best in your field seems like a cool idea, but don’t forget to read the small print. It will be hard. Really hard. There’s no avoiding it. It’s part of the deal. It will take longer than you hope. I know that there are exceptions and stories of overnight success, but you won’t be one of them. There will be detours. They may last a week, they may last a decade. Learn to enjoy these times, just don’t forget the end goal. The more you learn, the more you’ll realise how much there still is to learn. You will have to change. You can’t stay the same person and impact the world. It’s just not possible. You will have to make sacrifices. There will be times when you have a make a choice between doing what you want and doing what you know you must. A choice between feeling good in the moment or knowing that you’re on a journey to something greater. After reading such terms and conditions, you must be wondering what you’re getting yourself into. Is it really worth living your best life if it’s going to be so difficult? Yes, the answer is always yes, and don’t let anyone tell you otherwise. 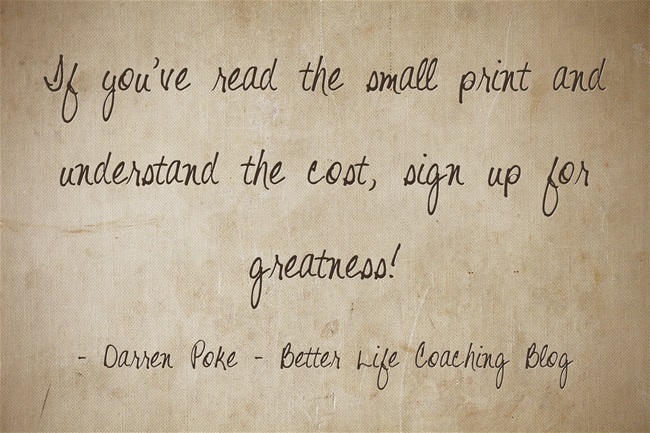 So if you’ve read the small print and understand the cost, sign up for greatness! Next post – What Should You Do When All of Your Hard Work Is Wasted?